Taco Gun is a lighthearted, local co-op PvP title where you shoot tacos and other food items at your friends in attempts to best them. Developed by Floating Island Studios and published by eNVy softworks, it adds a great new title to the genre. With a variety of guns, special abilities, and maps, you can have a great time with your friends as you fight against each other or in teams. Taco Gun has three multiplayer modes of play and one practice mode. These different modes are standard for the party PvP genre, but Taco Gun keeps them simple and entertaining. The first mode is Foodfight, which is your standard PvP level where you try to have the most kills in a specific time frame or kill a target number of people the fastest. You can set the time limit and number of kills required to win. The preset parameters are five minutes and five kills. This seems to be a great game length balance, especially for two players who are new to Taco Gun. The second mode is Team Foodfight. This lets you team up with your friends to battle. It works the same as Foodfight, but you’re in teams instead of solo. Your kills are added together when scoring. Because of this, the minimum amount of game time and kills needed to win is increased to ten. You also have to be aware of friendly-fire, as it can kill you unless you change it in the settings. The third mode is Elimination, where the winner is the last person to survive a minimum of rounds, rather than having the highest kill total. Elimination mode is not a team mode, and the minimum amount of rounds you have to survive is five. However, you can increase this in the settings. Each round ends when there is only one player left, and when you die you don’t come back until the start of the next round. The final mode of play is a practice mode. This is a single-player mode that allows you to try out different maps and characters without getting shot at. You can also use it to try out different settings so you aren’t dominated by friends or family with more experience. Unfortunately, there is no mode or system that includes AIs to fight or practice against. If you want to play Taco Gun (outside of simply practicing by yourself), you have to have at least one other person with you. Additionally, there is no online multiplayer option. Taco Gun is local co-op only. If you don’t have someone in the same vicinity to play with you, then you’re out of luck. There are seven different characters to choose from in each mode of play, and each character has their own unique gun and special ability. You’ll really like the variety of guns to work with, as they allow you to pick a character and gun that matches your play style and personality. The different character guns vary from short-range pistols to long-range cannons. Some weapons aim and hit better at close range with single, multi, or cluster shots (although you don’t want to stand too close or the shot will miss) while others are more effective from a distance. Each gun has to be reloaded eventually: You can either reload the gun yourself (which lets you reload at any time, rather than waiting until all food bullets are fired) or let the game reload for you once you’ve fired all your bullets. Taco Gun keeps track of how many shots you have left. At the end of your line-of-sight guide, there are multiple arrows. These arrows indicate how many shots you have left, whether it’s how many single shots or how many sets of multi-shots, depending on the type of gun and character you are using. This indication is extremely helpful, as it allows you to plan better when and how to aim so that you don’t put yourself at risk while you’re reloading. The special abilities give you something other than your main weapon to use while you fight. These range from bombs to boomerangs to enhanced gun capabilities. Most of them are self-explanatory, like throwing or leaving a bomb on the ground, but some are more difficult to use and track when they are available. If you can master the special ability of the character you’re playing, it provides a huge advantage because your friends are probably only paying attention to the flying-food bullets. You don’t ever need to be bored (unless you’re unlucky and get the same map again using the random option) with eight different maps, each with different challenges specific to the map. Some of these challenges can kill you, so you have to be aware of the environment. Other map challenges make it difficult to shoot your opponent, so you have to be aware of how to jump and move around the maps. Each map has its own theme. Currently, the maps available are: Train, Factory, Canyon, UFO, Kitchen, Ship, Space, and Volcano. Settings change the difficulty and add different challenges. My personal favorite is the gravity setting, which lets you decrease and increase the gravity on each map. This ranges from 0.40x to 3x the amount of regular gravity. This changes the ease or difficulty of jumping around, which can make certain map traps and challenges extremely difficult. Another setting that changes jumping is the gas mode. You use gas to use extra jumps in a row, so it limits how often you jump around. A bar appears beneath your character that grows so you know how much gas you’ve compiled. It definitely adds a humorous element to the fight as you build up gas and release gas to move around the map more effectively. There is also a no-reload setting, which makes it easier to shoot your friends and shortens the rounds since you aren’t waiting on reloading your gun. It makes gameplay easier, so if you’re playing with someone new, or with a younger crowd that isn’t able to strategize gun reloads, this is a great setting to get used to the gameplay. 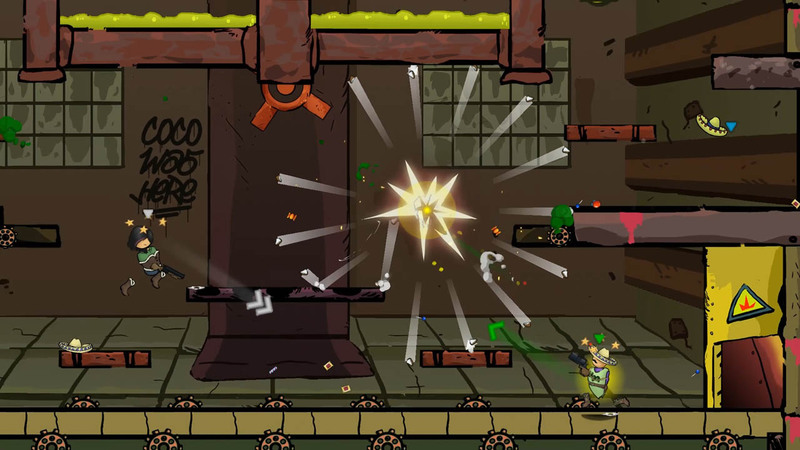 Taco Gun has five power-ups that you can choose to select or deselect. These power-ups appear throughout the map, sometimes in challenging locations that take skill to reach. When you collect the power-up, it changes the play style or gives you an enhanced weapon. These include a slow-motion power-up and a taco cannon that does more damage than your character’s gun. The power setting lets you adjust the way you use power during the fights. The three options include recharging, infinite, and normal. Unless you change the setting, the round will use the normal setting. The last setting is a big-head setting. The more kills you get, the bigger the head you have. It’s purely aesthetic, but it’s another element of humor to get big-headed as you dominate the playing field. The repetitive instrumental music is pretty standard for PvP titles, but with a hint of mariachi as a theme for the menus and starting countdowns. It’s fun and matches the taco theme quite well. Each map does have its own music that stylistically matches, such as the factory level playing music with a techno and metal feel to match the steampunk aesthetics and theme. This keeps the music from becoming boring as you play different maps and modes. Taco Gun is a fun title to battle it out with your friends and family. It can be pretty simple or use complex strategy, depending on how you prefer to play, with a variety of play styles that can keep the game entertaining and interesting after playing it several times. Its lighthearted fun with lots of tacos, food, and guns makes this a title you don’t want to miss if you like co-op PvPs.